Shovels are used to dig soft blocks, such as sand, dirt and snow. Wooden and stone shovels can be found inside loot chests in ruins, dungeons, and the skyhold. Shovels are crafted using one tool material and two sticks. Shovels can be used to deal more damage than by hand, however they deal the least damage than any tool of the same material and use up two durability points when used to do damage to a mob. There are five types of shovels, each with different mining speeds and durability. Wooden planks 60 Easiest to craft however it has the slowest mining speed. Can be found in the loot chest. 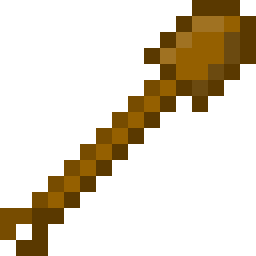 Cobblestone 132 Second easiest to craft, and slightly faster than the wooden shovel. Can also be found in the loot chest. Gold ingot 33 Fastest mining speed, however it is not recommended for regular use as it has very low durability, so is not worth spending one gold ingot on. Diamond 1562 Faster mining speed than the iron shovel, however slightly slower than gold. It has a lot of durability for how much it costs. Different shovels have different item ids.